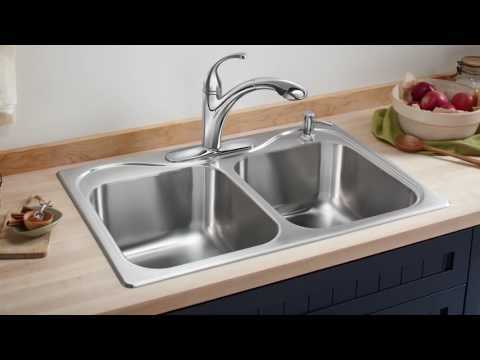 Under-Mount High/Low Small/Large Kitchen Sink, 31-3/4" x 17-1/2" x 5"/7"
Blending durable design with convenient functionality, the McAllister under-mount high/low double-bowl kitchen sink serves every kitchen need. A large, deep basin offers generous sink space for large tasks while a smaller, shallow basin makes the perfect disposal or chilling area. SilentShield(R) technology, an exclusive sound-absorbing system, reduces noise and vibration. It may be installed with the small basin on the left or right. Blending durable design with convenient functionality, the McAllister under-mount high/low double-bowl kitchen sink serves every kitchen need. A large, deep basin offers generous sink space for large tasks while a smaller, shallow basin makes the perfect disposal or chilling area. SilentShield© technology, an exclusive sound-absorbing system, reduces noise and vibration. It may be installed with the small basin on the left or right. Dimensions: L 32-3/4", H 7", W 17-1/2", D 7"